“You know Le Touquet, don’t you,” I said to my father yesterday. “I cannot imagine it,” he replied. Neither could I. Le Touquet, that resort for the French wealthy and the chic? Where Parisiens go for Le Long Weekend, and walks on the beach punctuated with a lunch of moules frites and an afternoon sleep. Taken over by thousands of working-class bikers? Quelle merde! 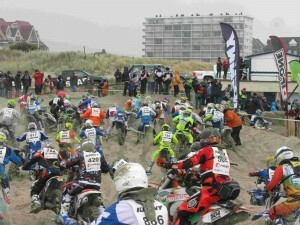 But that is Enduropale, France’s second most important sporting event after the Tour de France (claim the organisers). 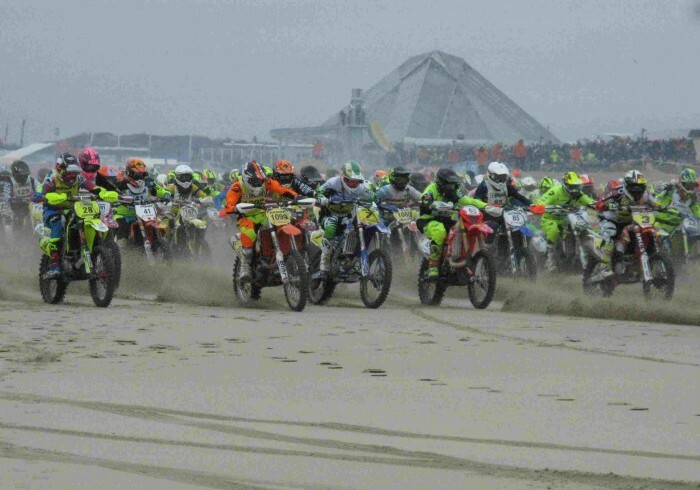 Now in its 41st year, Enduropale is a giant motocross happening on the beach at Le Touquet, attracting hundreds of thousands of supporters (especially the biking fraternity) every year. 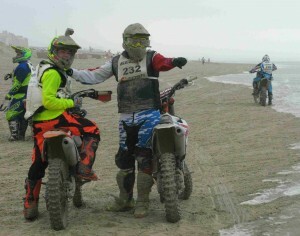 Imagine a day of motorcycles and mayhem, with around 1,000 riders competing for three hours across the sands at low tide. Picture flying sand, rain and salt spray from the sea, and the incessant noise from hundreds of motorcycles at once, and you begin to get a flavour of the event. But nothing beats actually being there, and at the start line on the beach, it takes a certain nerve to stand still as a thousand bikes come roaring towards you jockeying for the best position. This is no GP; the start line is some 300 metres wide. 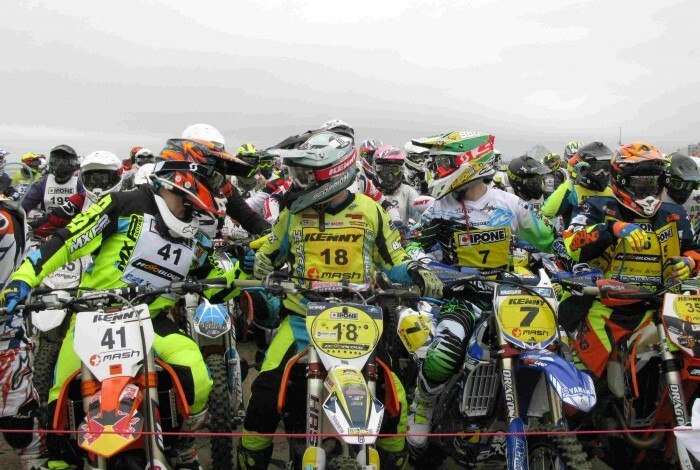 Even then, with so many riders taking part, the start has to be split into two phases spaced 40 seconds apart. 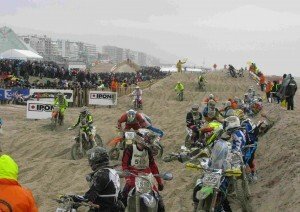 Once launched, the riders on their motocross machines, typically with 350cc or 450cc single-cylinder engines, wrestle their bikes for the next three hours over a specially engineered course of hillocks and troughs in the sand. Naturally, once the first few riders have passed, the course becomes rougher and harder for those that follow. Enduropale is well-named. 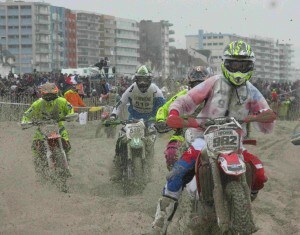 It is very much a test of endurance, for riders as well as machines. Older riders are a rarity. 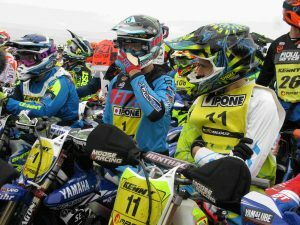 Most are aged under 25, and towards the end of the event those who fell off (which is part and parcel of motocross) were visibly staggering from exhaustion, barely able to pick themselves up, let alone the machine. The French sporting media were out in force, from the local press to national broadcasters such as TF3. Some of the video sequences produced during the day were truly riveting, playing up the glamour of the men and their machines. But on the course itself when you are up close, you can see each rider fighting his own personal battle against exhaustion, strains and minor injuries as the day goes on. I have no doubt that the toll on the human body is immense. 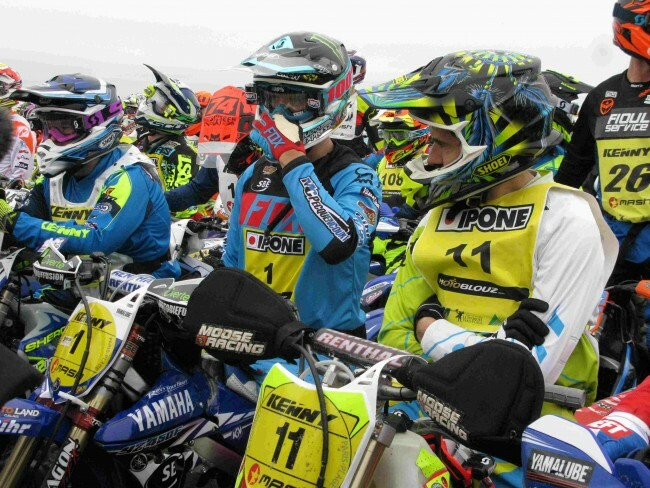 All motosports are tough, but Enduropale is one of the more extreme forms of the sport. Completing the race, even participating at all, represents the triumph of the human spirit, of the human will over tiredness and bodily discomfort. Which of course is part of the glamour surrounding the event, and its appeal to young people of all ages. Yet although it remains very much a working-class event in its appeal, Enduropale enjoys support across the spectrum of French society. I met the newly elected President of the region Nord-Pas-de-Calais-Picardie, Xavier Bertrand, who was happy to tramp the sands glad-handing with spectators. In this respect Enduropale demonstrates perhaps the true spirit of la France republicain, in the traditional sense of French republicanism. Le Touquet is solidly middle-class; it represents old money, quiet wealth. The newly elected regional president is a conservative, displacing his long-time socialist opponent. 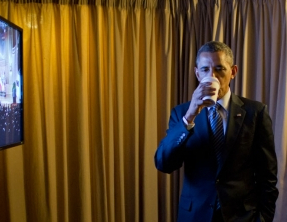 Yet he needs the support of the working people of the region, the fourth most populous in France. Otherwise they will vote National Front (the right-wing nationalist party). As one local told me, working people in this part of France are no longer voting Socialist. They are so unhappy with the present economy that they will vote nationalist, the classic protest vote. So Enduropale,in reality, operates on two levels. On the surface it is a glamorous and hugely popular sports event, with a loyal following among the local, predominantly working-class biker fraternity. Which, in this part of France at least, is a young man’s pre-occupation. At the same time, the event forges a link between the solid, middle-class respectability of the local region, and the more rebellious nature of the largely urban workers. In the history of France, such links trace their sources as far back as the birth of the republic. As such, you can say they represent the true spirit of la France republicain. Vive le sport! – https://flic.kr/s/aHsksSGcQt Credit Paul Grammerce. – https://www.flickr.com/photos/92922758@N05/albums/72157664042470721 Credit David McCairley photography.